We’re now a decade on from the Great Recession where the UK’s labour market took a turn for the worse. Back in 2009, we were panicking that unemployment could hit over three million. Today, we’re celebrating the highest employment rate – at 76.1 per cent – since World War II, while unemployment is also at a 40-year low (at 3.9 per cent). The best news about today’s record employment levels however, is that it is broad-based, with every region and nation in the UK better off today than before the crisis. Most of those regions who were furthest behind have also caught up the most. To illustrate this, the chart below plots employment growth since the financial crisis against pre-crisis employment levels. 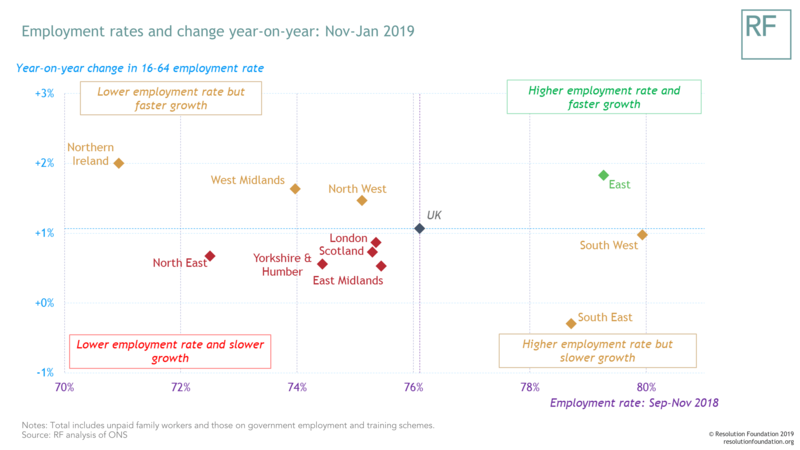 It shows that the five of the six UK regions and nations with above-average jobs growth have come from a starting point of lower employment levels. Wales has led the pack since the financial crisis with employment growth over 8 per cent, followed by London and the North West (both at almost 7 per cent). The latest figures back up findings in a recent RF report which found that some of the largest improvements in jobs have been felt across traditionally low employment urban areas like South Yorkshire and Merseyside. Today’s figures show that the highest employment rate in the UK is in the South West of England (79.9 per cent). This corner of the country also has the lowest rate of economic inactivity (17.6 per cent) and the lowest unemployment rate (2.9 per cent). This puts the South West on a par with countries like Switzerland (which has a 15-64 employment rate of 80.6 per cent) and Sweden (77.5 per cent). For the UK to become a world leader in near full employment, we need all parts of the country to perform as well as the South West. Britain’s jobs surge hasn’t just reduced the geographic inequality of employment either. As local labour markets across the country tighten, people who are traditionally furthest from the labour market are benefitting the most – further reducing ‘employment inequality’. Yesterday’s announcement by Travelodge that, in order to create 3,000 new jobs by 2023, it is targeting parents to fill these roles, suggests that a tighter labour market isn’t just about fewer workers competing for a particular job. It’s also about forcing large employers to rethink and redesign jobs. The Travelodge announcement is indicative of a wider trend towards lower-activity groups benefiting from tighter labour markets, as the chart below shows. ‘Low activity’ groups have seen the biggest employment gains since the financial crisis, particularly single parents and ethnic minority workers. Focusing on the UK’s star-performing region – the South West – we can see that single parents’ employment increased by 10 percentage points (compared to 12 percentage points for the UK), while wider maternal employment by 7 percentage points (and 5 percentage points across the UK). The latest employment figures are unambiguously good news that we should celebrate. But there is a potential snag in the fact that rising employment is set against a complete stagnation in business investment. As Brexit uncertainty heightens, it may be that firms are labour hoarding – investing in staff rather than new equipment. While this is good news on the jobs front, it’s less welcome on the productivity front, which ultimately holds the key to sustainable living standards growth. We won’t know this for sure until the Brexit fog clears. And as that still seems some way off, for now let’s celebrate rising employment, and falling employment inequality.